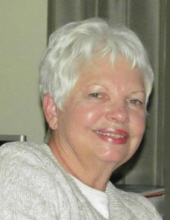 Margaret A. Sturgill, 75, of Middletown, died Friday, November 16, 2018, at Spring Hills Middletown. She was born in Middletown, Ohio on March 8, 1943 to parents, Elmer Adams and Hazel (Paullin) Adams. Mrs. Sturgill is survived by her husband, Ernest Dallas Sturgill; daughters, Michele (Edward) Dible and Lorraine (Scott) Woodrome; mother Hazel Bell; sister Andrhea (Steven) Poffenbarger; brothers, Ed (Mary) Adams and Butch Adams; grandchildren, Marilyn (Kevin) Scheiding, Caroline (Joseph) Cox, Margaret Dible and Dallas Dible; and great grandchild, Evaleena Scheiding; and many other loving family and friends. Margaret’s love for the Lord and her love of life and laughter will never be forgotten. Funeral Service will be held Tuesday, November 20, 2018 at 11:00 am at University Baptist Church, 4125 Riverview Ave., Middletown with Reverend Charles Deglow officiating. Visitation will be on Monday, November 19, 2018 from 5:00 pm – 8:00 pm at WILSON-SCHRAMM-SPAULDING FUNERAL HOME, 3805 Roosevelt Blvd., Middletown, OH. Interment will be at Miltonville Cemetery. To send flowers or a remembrance gift to the family of Margaret A. Sturgill, please visit our Tribute Store. "Email Address" would like to share the life celebration of Margaret A. Sturgill. Click on the "link" to go to share a favorite memory or leave a condolence message for the family.